This girl's new best friend is always by her side. She has known her her whole life, but only now they are friend. This friend supports and encourages her. They also have fun and share beautiful moments. And also very important, The girl knows her best friend is going to be there for her forever. "Any guesses who my best friend might be?" 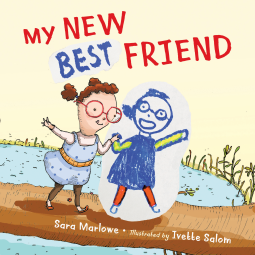 she asks, "My new best friend is me!" The story's goal is to boost self-compassion. We should treat ourselves in the same way we treat those we care about, with kindness, understanding, and love. Being angry and unkind with ourselves is a form of inner bullying. The text is sweet without being melodramatic, and the illustrations lovely. I find fantastic the idea of represent the friend as a drawing of the girl. This is a great resource to approach an interesting and important topic. I would strongly recommend it.